DeMatha’s James Brown shooting over future NBA vet Tim Bassett of rival McKinley Tech in 1969 game. The story behind the No. 1 that got away from DeMatha is as interesting as all the titles that didn’t. McKinley and DeMatha played each other twice in the 1968-1969 season. McKinley beat then-top-ranked DeMatha, 68-55, in the M Club Classic tournament at the University of Maryland. DeMatha’s Ray Hite recalls feeling overpowered by a McKinley lineup that included four future All Mets (Michael Bossard, Ronnie Hogue, Randolph “Apple” Milam and Tim Bassett), and says he never felt like the game was as close as the scoreboard indicated. That defeat left an impression on DeMatha’s all-American captain (and future TV sports commentator extraordinaire), James Brown, that lingers to this day. Brown tells me he was recently asked to name the greatest team he faced in high school. Brown grew up in the McKinley Tech neighborhood, and would have gone to the public school had he not been recruited to the Catholic League overdogs by DeMatha coach and future Hall of Famer Morgan Wootten. McKinley went undefeated in its public school league for the rest of the season after the M Club win, and DeMatha won the Catholic League. But DeMatha got an unexpected shot to reclaim the top spot when McKinley accepted an invitation to the Knights of Columbus tournament, an eight-team postseason event held at Catholic University. And, the hopes and dreams of DeMatha backers and every basketball fan in the city were realized: The tournament’s top two seeds and the highest ranking teams in the city made it to the finals. A McKinley-DeMatha rematch really was going to happen. Wootten would later admit that he went into the tournament only focused on retaking the No. 1 ranking. He told the Post that of all the KofC entrants, he’d only game-planned for McKinley. He’d even installed a gimmicky defense in practices leading up to the event, which he’d named the “blitz trap,” specifically designed for that one opponent. The scheme called for his guards to double team the McKinley ballhandler at all times, thereby making it more difficult to pass inside to the big men that killed DeMatha the first time around. But despite all the preparation, things looked lost for DeMatha even before the championship game tipped off. In the semifinal game against a St. Thomas More squad from Connecticut (led by future Providence legend Ernie DiGregorio), Brown signaled to Wootten to take him out. “James came out and collapsed in my lap,” recalls Wootten, now 87. Brown was admitted to nearby Providence Hospital and diagnosed with exhaustion. Brown, whose reputation in the D.C. area over the last half century has never been less than saintly, now says trying to decide where to go to college, at a time when every school in the country was trying to get him, had worn him out physically and emotionally. Brown says he later heard from his neighborhood pals that McKinley players thought the KofC championship was theirs with him in a hospital bed. So Hite took matters into his own hands. He shot on the next five possessions, and made every one, putting DeMatha up 10-4. The Stags never looked back. Wootten’s freak defense worked just as he’d drawn it up, and kept McKinley’s bigs from putting up big numbers. The final was 95-69. McKinley star Apple Milam confirms what Brown remembers about his team’s state of mind. “What went wrong was we were overconfident,” says Milam, who still makes most lists of the best high school players in D.C. history. “Our guys thought that with James Brown out, we were going to win. As Hite, who ended up with a game-high 31 points, was being named tournament MVP, Brown made an appearance and joined with his joyous teammates at the trophy ceremony. Wootten told the Post the win over McKinley was the biggest victory of his career, topping even the game against Power Memorial in 1965 in which DeMatha snapped Lew Alcindor’s squad’s 71-game winning streak. The paper immediately named DeMatha No. 1, and cited the rout of McKinley as proof of Wootten’s squad’s superiority. There were no more games for either team scheduled. The season was over. That was the eighth time in nine years DeMatha finished on top. Then came the real drama. McKinley backers cried foul as soon as the poll was published. The McKinley side contended that the team only accepted an invitation to the tournament because they thought they’d already wrapped up the top spot in the rankings, and therefore had nothing to lose. That argument made some sense: Turns out that the Washington Post had indeed traditionally put out its final rankings prior to the Knights of Columbus tournament. This was the first time that the most important poll was published afterwards. But that competition was abandoned after a horrific race riot at D.C. Stadium at the end of the 1962 city championship football game. The KofC tournament, while a fine event, wasn’t considered anything close to a proper replacement for the city tournament, since it always included several out-of-town squads. The end of the city tournament meant the Post effectively controlled who could claim bragging rights for the season through their last poll. Come out on top in the last poll, and you’re immortal. A report in the Post said “about 1600” students, or about 84 percent of the school’s entire student body, had signed the document. The editors invited leaders of the protest inside for a meeting. Post officials tried explaining that the break from protocol about publishing the last prep poll before the postseason tournaments had nothing to do with an anti-McKinley or racial bias. The decision to add a post-tournament poll, the paper’s bosses explained, had been made months earlier, at the beginning of the basketball season, and was an attempt to duplicate college football polls, which in recent years had broken their own tradition by publishing a final poll after the the bowl games were played. That argument aside, the McKinley backers’ activism put the paper on the defensive. The Post’s headquarters was only blocks away from the city’s 14th Street corridor, major portions of which were burned out less than a year earlier in riots following Martin Luther King’s assassination. So race was an even pricklier matter than usual in D.C. And the rankings dispute had clearly become racial. A story about the protest that ran in the sports section noted that DeMatha’s team “had three white starters,” while McKinley “had no white players. So the editors’ explanation about why they moved the last poll didn’t sway McKinley advocates. Editors only got the protesters to pack up their placards and go home only by agreeing to endorse a rematch between McKinley and DeMatha. Then the Post followed through on its commitment to the protesters by taking the very odd step of writing an unsigned editorial, real estate generally reserved for matters of national or global import, calling for a playoff between the city’s top two high school hoops squads. Alas, the winner-takes-all matchup wasn’t to be. D.C. public school athletic officials said there was no precedent for allowing an additional game to be played and told the Post that it was “highly improbable” that the city school system would grant McKinley permission to participate. But those administrators never had to make that hard decision, because Wootten rejected the request to play a rubber match out of hand. So, Post editors decided it would be best to act as if the second McKinley-DeMatha game didn’t count, and that allegedly final poll with DeMatha on top was never published. Several members of McKinley’s 1969 team went on to athletic glories. 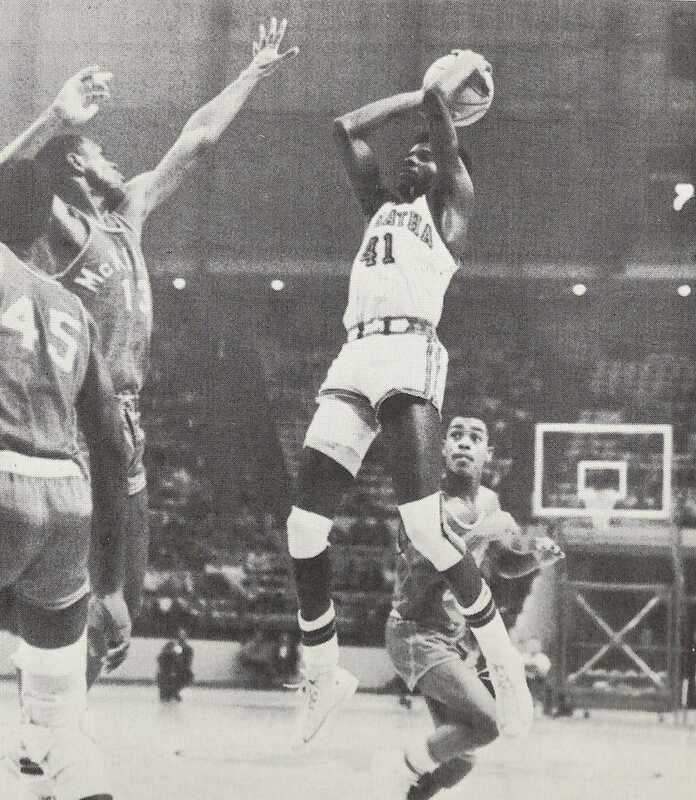 After graduating from McKinley, two time All-Met guard Ronnie Hogue became the first African American to get an athletic scholarship at the University of Georgia, and still holds the single-game scoring record at the school, with 46 points against LSU in a 1971 matchup. He was drafted by the Washington Bullets in 1973 but didn’t make the squad. Hogue, who now lives just outside D.C., politely declined to be interviewed for this story, citing family issues. Lonnie Perrin, the seventh man in the 1969’s “Magnificent Seven” lineup, went on to play in the NFL for the Denver Broncos, Chicago Bears, and Washington Redskins. Tim Bassett, one of McKinley’s big men and another All-Met, joined Hogue on the team at Georgia, then went on to have a long professional career. He played with the San Diego Conquistadors/Sails and New York Nets, both in the ABA and after merging with the NBA, and then spent a year with the San Antonio Spurs. He finished his career in 1982 playing in Varese in the Italian league, LBA. Bassett died of cancer last December. He’s not the only Techite no longer around, either: McKinley Armstrong, coach of the McKinley team, died in 2010 at 81 years old. Another All-Met on the 1969 McKinley squad, Michael Bossard, also a big man, died in 2014. Guard Kevin Tatum, who would go on to be a sportswriter with the Philadelphia Inquirer, died of throat cancer in 2016. The magazine DeMatha now hands out to potential recruits and their families to sell them on the school has a section detailing many of the basketball program’s deeds. Among them: a list of all the years that ended with the school ranked No. 1 in the Post poll. It’s a very impressive list. The 1968-1969 squad isn’t on it. Wootten, who retired in 2002, has let administrators know he isn’t happy about the omission. From the sound of things, he’ll never accept having that title taken away. Brown, who never goes too long without professing respect and love for Wootten, says he’s always been far more at peace with the Post’s decision than his old coach. Milam, who has remained friends with his old neighbor Brown to this day, is fine with taking the city title from DeMatha, too.